Bristol Blenheim Mk. I, K7040, '114", 114 Squadron, Royal Air Force, RAF Wyton, Cambridgeshire, March 1937. This aircraft was Dark Earth and Dark Green over Night (black). The wing and fuselage roundels were superimposed on a yellow background. 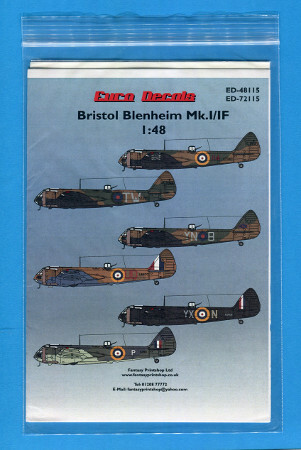 Bristol Blenheim Mk. I, K7059, "TW", 90 Squadron, Royal Air Force, RAF Bicester, Oxfordshire, September 1938. This aircraft was also Dark Earth and Dark Green over Night. The yellow roundel outlines were over painted. Bristol Blenheim Mk.IF, serial unknown, "YN.B", 601 Squadron, Royal Air Force, RAF Hendon, Middlesex, Summer 1939. Dark Earth and Dark Green over Night. The underside of the starboard wing was white with a Night flap. Bristol Blenheim Mk. I, L7760, "UQ", 211 Squadron, Royal Air Force, Tatoi, Greece late 1940. This aircraft was in RAF Desert Theatre colors Dark Earth and Middlestone over Light Mediterranean Blue. The fuselage roundels were superimposed on a yellow background. Bristol Blenheim Mk.IF, K7159, "YX.N", 54 Operational Training Unit, Royal Air Force, RAF Church Fenton, North Yorkshire, December 1940. This aircraft was overall Night. The fuselage roundels were superimposed on a yellow background. Bristol Blenheim Mk.IF, LI210, "P", 771 Naval Air Squadron, Fleet Air Arm, RNAS Hatston, Orkney, Scotland 1942-43. This aircraft was in Royal Navy colors Dark Slate Grey and Extra Dark Sea Grey over Sky Type S. The wing and fuselage roundels were superimposed on a yellow background. The quality of the printing is first class. The colors are bright. The decals are crisp and in register. There is minimal carrier film. This is a superb decal sheet. Each of the 6 decal options is interesting and all of the aircraft are colorful. 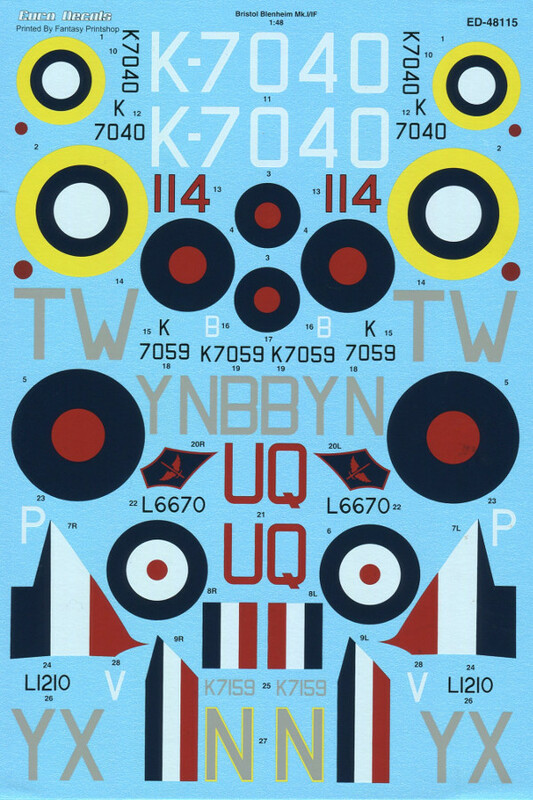 I recommend this decal sheet for RAF bomber fans. I would like to thank Fantasy Printshop for the review sample.